In our 8th and final podcast in the Covenant Confusion series we summarize a list of bullet points of the many differences between the Old Covenant with its burdensome demands compared to the New Covenant of Love and faith. Notice the contrasts and realize the New Covenant is not an amendment to the Old nor were they meant to be mixed together. The Old was completely wiped out and replaced with something much better. 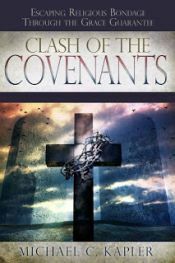 The differences between the covenants are vast and we should avoid confusing the Old Covenant law with what Christ did for us through His finished work. So enjoy the uplifting grace message. In our SS we started a new series on Deuteronomy, "Jesus' Favorite Book" It's all I can do not to open my mouth and argue with these well meaning fellow believers. Our church is mixing more and more law in with grace. On one hand saved by grace alone, BUT if you're "really saved" you'll do this, that, and this other thing. Certain members feel they can decide who is saved and who isn't by the work they do or don't do. They have replaced the true Fruit with works, but call it "ministry". This sort of attitude has rally turned off my teens. We are listening to your podcasts together now. Thanks for sharing. I can completely relate to what you are saying because many of us have witnessed the exact same things or at least very similar. It's hard to believe the church "system" as a whole has been so misdirected when it comes to understanding what the gospel really is. Unfortunately this is the "fruit" of religion and frankly, it's nothing new but has been going on for many centuries. But I'm convinced most people want the truth. They want the peace that can only come through God's grace which is the result of His finished work. He did it all, expecting nothing in return because that's what Love does. For those who long for more than what typical works-oriented religion has to offer, this message of peace will change the way people see God...And help them to realize how God sees them (perfected). I am no preacher I do feel a whole universal sound wave synchronizing misunderstood notes. Creating panic to whom is accepted by this one creator we call god. I been struggling in my efforts to do this myself but is it fair to add perhaps it's finding acceptance in one self. I mean forgiving my fare amount of irresponsible situations may be easy to forgive but to forgive my inner self. To actual give the time to unconditional accept and love my inner child once and perhaps the first time in my life. Perhaps the nurturing sphere our vehicle we should be more concerned about before involving God as a strict judging punisher from a horror script. I believe humanity capable to create and provide in any terrain including woman , ect are god like themselves. This electric timeless life force does not die , may change form but that is what I think any God would want , everyone to love and care inside and out , all around in everything. It's the imagination from birth that is squandered by systems, believe in this no that doesn't exist that I believe is stopping the true meaning of what means the most in life.